The team will run the Aprilia RSV4 for the first time at the Jerez circuit in Spain for three days, as they look to lay the foundations for a strong 2017 campaign. Announced in the summer of 2016, the Aprilia factory-supported team marks the partnering of Aprilia Racing and the UK-based Shaun Muir Racing. The team will field riders Eugene Laverty and Lorenzo Savadori and have set their targets high for the 2017 season, in which they will continue their relationship with title sponsor Milwaukee Power Tools. The test runs from Monday 21st to Wednesday 23rd November, and will give the team a chance to learn as much as they can about the RSV4 before the winter break. 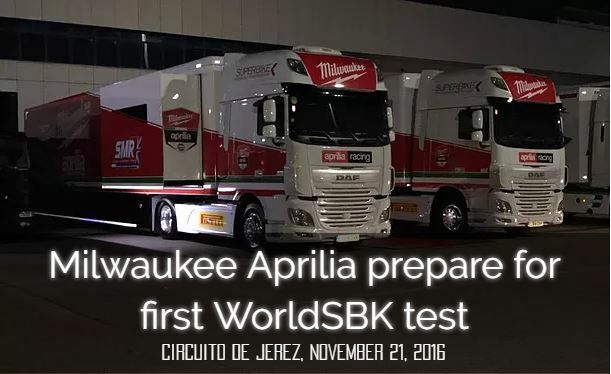 Milwaukee Aprilia will also launch their social media profiles and website over the test, and will provide regular updates on the team and their progress at the test. “It’s a new and exciting chapter for SMR to work with Aprilia Racing, and there is a lot of optimism about what we can achieve. We are not underestimating the size of the challenge ahead of us, but without a doubt we are looking forward to the challenge. This first test at Jerez is very important for us, and we need to integrate the Aprilia and SMR staff and form strong relationships. We also have two new riders to work with, and I think Eugene and Lorenzo will work really well together. “One racing season only finished a week ago, but I am itching to get going with 2017 in WorldSBK. The RSV4 is the bike I remember most of my success on, and I got to sit on it for the first time tonight which felt like coming home. I’m already impressed by the preparations of SMR and Aprilia; to arrive at a test in November with the trucks and box prepped like a race weekend shows that the team are a very professional outfit and keen to get going. They are obviously very motivated and I am motivated to get winning again. “I am really happy to continue with Aprilia Racing in 2017, and it means a lot to me after my first year in WorldSBK with them. It is great to be here in Jerez with the SMR team, and I know that they work very hard for results. I am really excited to get on the bike again and use some new parts that I didn’t try this year. It is really important that I find a good set-up with the bike for 2017, and we will try hard to work on that this week. I didn’t test very much this year, so I am glad we have some time before next year to prepare.